USB Power Sensors have been available for over a decade. In this article we will introduce some basics of power measurement, the attributes of this capability to newcomers, and elaborate on recent developments. The recent proliferation of low-cost, powerful laptop computers and their peripheral accessories has opened an unprecedented capability in the realm of RF and microwave test capabilities. Additionally, performance display, storage, data transfer, printout and backup have become extremely user-friendly. 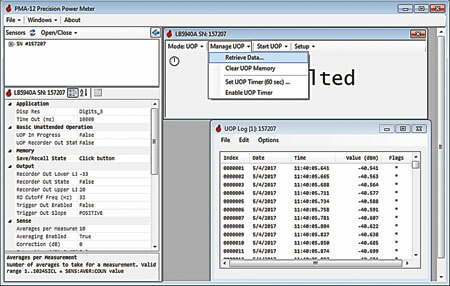 For example, USB based Vector Network Analyzer (VNA) measurement modules have been available for several years. These can make S-parameter measurements with rather incredible dynamic ranges, in excess of 160 dB. Pocket-sized spectrum analyzers that can operate as high as 110 GHz will allow 5G network technicians to make measurements directly at the device under test (DUT). Accurate high-frequency power measurement has been a high priority for as long as RF sources and transmitters have existed. Many different types of sensors have been designed over the years. These include crude coupled loops with light bulbs, bolometers, diodes operating in square law range, and other devices using thermoelectric detectors. Even modern spectrum analyzers are accurate enough to make reasonable power measurements. There is inherent difficulty in measuring waveforms and power directly at higher frequencies. This situation is not unlike the challenge that has always existed in high-frequency receivers. Since the early days of radio, conversion of signals to single or multiple intermediate frequencies (IF) has been a prudent way to process signals. Somewhat similarly, the techniques used to measure power alter the microwave signal in some manner to ease the process. Figure 1 • 18GHz USB True RMS Power Sensor and Computer. Among the techniques mentioned earlier, the three main types of power detectors are bolometric, thermoelectric, and diode. Bolometric detectors work by converting RF power to DC power. Thermoelectric detectors work by substituting a thermally generated voltage for RF power. Diode-type sensors function by rectifying the RF signal. Bolometric sensors are typically very stable, linear, and can be easily modeled with simulation software. However, bolometers operate only in a narrow dynamic range, have limited power capabilities, and respond slowly to stimulus. Thermoelectric sensors are also linear, have better sensitivity than bolometers, and exhibit good dynamic and power ranges. For general use, they typically require supporting electronics and require a reference point to a known frequency to fix their operation. They have a dynamic range of approximately -35 to +20 dBm ( 0.32 uW to 100 mW). Diodes are typically nonlinear over part of their operating range and have fast response time. For a certain range of power levels a diode detector’s output voltage is proportional to its incident power measured in watts. This is called “square law” because in linear operation Ohm’s law states that voltage is proportional to the square root of power. Therefore, in the square-law region, power’s relationship to voltage is squared. For a typical diode, the square law detection region exists for input power levels from the noise level up to approximately -20 dBm (0.01 milliwatt). A transition region exists between -20 dBm and 0 dBm input power and furthermore, there is a linear detection region that extends above about 0 dBm. The newer generation of diode-based sensors achieves excellent dynamic range and accuracy by utilizing multiple paths, all operating in the square law range. These are often referred to as True-RMS sensors and are favored for general-purpose and high-accuracy applications because they can measure any signal, regardless of its modulation bandwidth. Digital signal processing and microwave semiconductor technology have advanced significantly and improved capabilities can be realized for power measurement applications. 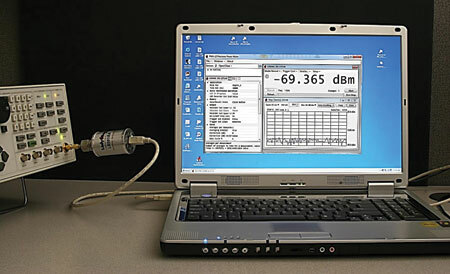 Power measurement can be performed using a USB power sensor1 (Figure 2) connected directly to a computer through a USB connection. The sensing element and all calibration electronics are built into the power sensor’s shielded metal housing. 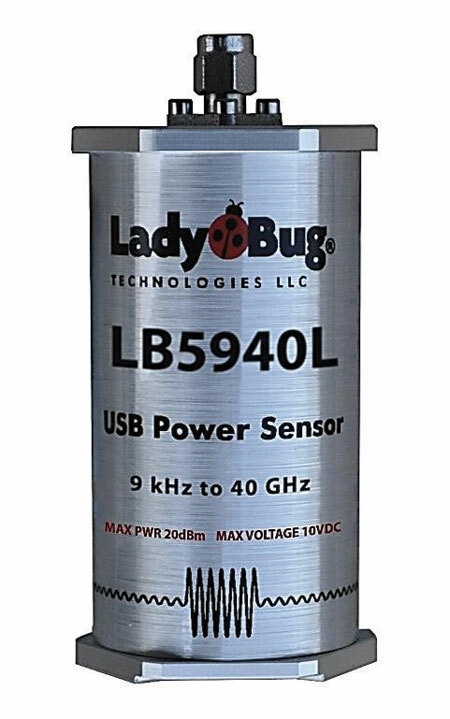 For example, LadyBug Technologies LLC manufactures a patented No-Zero technology. This sensor requires no user zeroing or calibration prior to use, even for high-accuracy measurements at its greatest sensitivity. Figure 2 • USB True RMS Power Sensor. Wideband power sensors can quickly and accurately measure peak, pulse, average, peak-to-average ratio power measurement, rise/fall time, pulse width, and complementary cumulative distribution function statistical data for wideband signals. There are currently more transmitted signal types than ever. They include AM, FM, CW, synthesizers, and Pulse RADARs, cellular towers, cw local oscillators, PLLs, RFID tags, RFID devices, 5G and IoT devices, automotive radars, and numerous other stimuli. Some of these signals are quite complex. How is a Power Meter Connected to a Signal Source? The power range of a typical USB based power meter is -60 dBm to +20 dBm (1 nanowatt to 100 milliwatts). It is obvious that measurements of greater than 10 milliwatts lend themselves to the use of indirect means such as couplers rather than direct in-line measurements. Initially a system’s power output can be measured directly with a power meter using appropriately power rated attenuators. For example, the output of a source (oscillator or transmitter) can be measured and then as downstream components are added, such as coaxial cables, filters, amplifiers, and power splitters, spot measurements can be made to observe their impact. Once a system is fully integrated and terminates to an antenna, mixer, or other component and is in normal operation, a means to sample power and detect anomalies either continuously or periodically may be needed. Historically, power sensors work cooperatively with lightly coupled directional couplers of known value, e.g. 20 dB, to sample power on a transmission line without introducing significant extraction of energy to corrupt the measurement. For example, a well matched 20 dB coupler will only remove 1% of the forward power in order to make the measurement. Better yet, a 30 dB coupler amounts to 0.1%. Pulse-profiling sensors capable of measuring average power, statistical peak and pulse power as well as a time domain plot of a signal’s pulse modulation with instantaneous display on a laptop or similar notebook computer is unique, and nicely reveals the source’s performance properties. These sensors offer many advanced features including trace averaging and filters (Figure 3). Figure 3 • Pulse Profiling Software Utilizing Trace Averaging and Filters. The introduction and now widespread use of new digital modulation techniques and multiplexing has added new challenges to the measurement of modulated signals. These are generally classified as TDMA and CDMA. This presents special challenges not encountered with CW, AM or FM signals. There are a number of trade-offs that must be accurately measured in order to optimize cellular coverage area, maintain efficiency, and minimize interference. When observing complex cellular signals, it is particularly important that the power sensor be appropriately selected. Conventional thermal power sensors cannot accurately measure complex signal characteristics because they cannot delimit specific areas of power contribution in a timeslot. Unfortunately, thermal sensors average the RF power that occurs over the entire time period. Sampling of the power envelope over time is feasible with USB-based and other diode sensors. A pulse profiling measurement trace can include signal details such as overshoot, interference pulses, and other glitches. Also captured are signal edges of a pulsed RF signal in proportion to its power2. Sensors that measure peak power have very short time-constant behavior, less than a microsecond, which allows capture of pulsed power modulation envelopes. Pulse profiling sensors can be used to display power vs. time in a manner similar to an oscilloscope. This permits capture of waveform details. Time-slot and gate structures can be added to pulsed waveforms. By graphically editing the gates added to the “scope” window, we can selectively suppress unwanted components at the beginning and end, which occur, for example, in the transition between two timeslots. 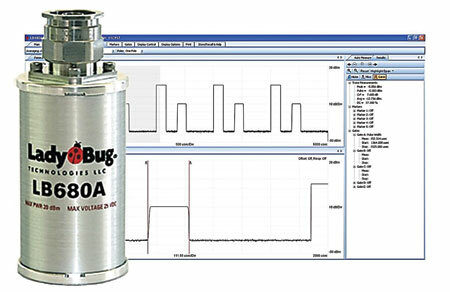 The power sensor in Figure 4 and its associated software display show just some of the capabilities of a typical pulse profiling sensor. Some advanced USB power sensors can be used in unattended autonomous applications. Data logging can be performed to an internal flash memory and only a USB power adapter costing about $10 is required to provide power to the sensor3, 4. When used in conjunction with tests such as Environmental Stress Testing or Highly Accelerated Temperature and Humidity Stress Test (HAST), the USB-based sensor can log data in order to capture the exact time of failure. This unattended feature (Figure 3) can also be a valuable asset in measuring the performance of power amplifiers employed in cellular base stations that are powered by dynamic power supplies for high efficiency. The opportunities are numerous for this capability and growing every day as our wireless infrastructure rapidly expands. For example, cellular towers are proliferating in more remote areas, accessible only by means such as helicopters. As RF and microwave sensor technology advances, some devices may be placed in hazardous areas where unattended power monitoring is vastly preferable. Figure 3 • 40 GHz LB5940A Unattended Operation Mode Data Retrieval. Orwill Hawkins serves as Vice-President of Marketing at LadyBug Technologies, Santa Rosa, Calif. He has over three decades of experience in management, marketing, engineering, and manufacturing. Orwill has extensive hands-on design and manufacturing experience in the RF, analog, and digital fields. Among the many products he has designed and marketed are a self-contained RF field-disturbance burglar alarm system; a sailboat speedometer; and various robotic servo systems. Additional inventions include a prototype oscilloscope and a CNC cutting system. He can be reached at Orwill_Hawkins@ladybug-tech.com. 1. R. Hawkins, “Reflection/Transmission Measurements Using USB Power Detectors,” High Frequency Electronics, March 2009, pp 34, 36-38. 2. 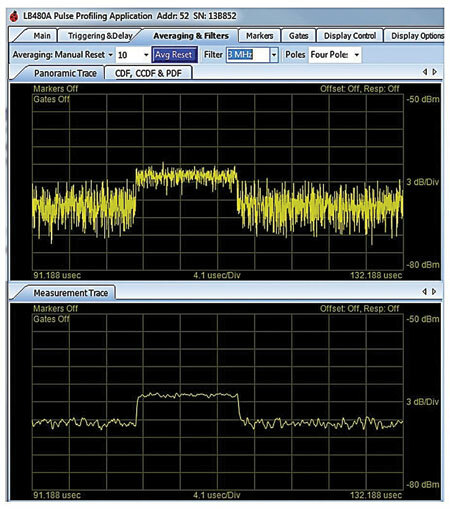 “Gated Measurements Made Easy,” News from Rohde & Schwarz, No. 185, 2005, pp 15 – 17. 3. O. Hawkins, “Logging of RF Power Measurements,” High Frequency Electronics, December 2013, pp 22 – 29. 4. O. Hawkins, “Using Power Sensors in Unattended Applications,” High Frequency Electronics, September 2015, pp 34 – 40.